What’s the magic formula for jukebox musical success? Take ridiculously catchy pop tunes, nestle them in a fairy tale loaded with intergenerational intrigue (and flirting), set it on a gorgeous Greek island in summer, and then say the magic word — ABBA. That’s how Mamma Mia! became the fastest show to ever crack the top 10 of all-time longest-running Broadway musicals. Worldwide, it’s been even more successful, triumphing on big stages from Shanghai to Moscow. Fortunately, this weekend you won’t have to travel quite so far, as PCPA presents Mamma Mia! at the Solvang Festival Theater July 27-August 26. 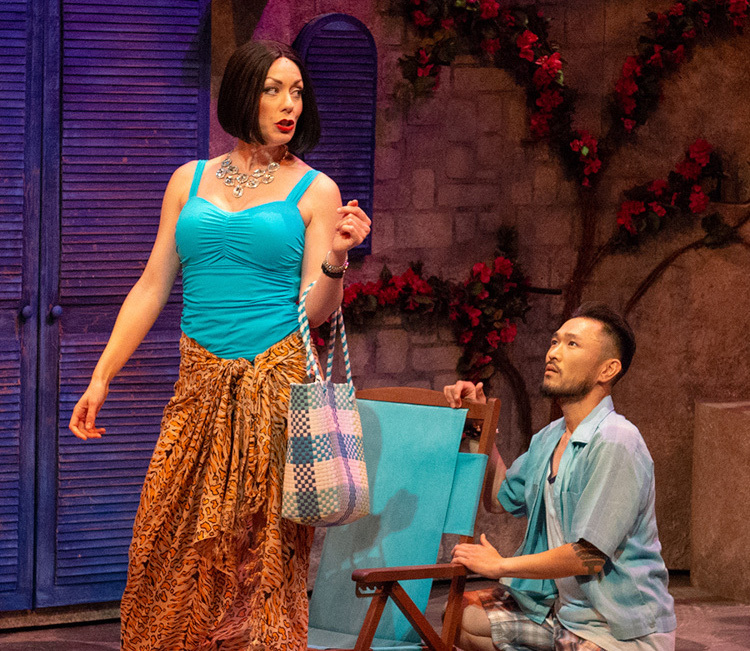 The show’s Solvang debut follows closely on the wide release of Mamma Mia! Here We Go Again, a big-budget Hollywood sequel to the popular 2008 film starring Meryl Streep. Moviegoers on the rebound from this Streep-less, hit-deprived second helping of Mamma Mia! on-screen can take heart; PCPA knows what’s required for you to fully get your ABBA on, and director Brad Carroll and a crack cast stand poised to deliver it. Carroll, who spent his vacation on Santorini doing “research” for the production, cited the search of the young bride, Sophie, for the identity of her father from among three very charming possibilities as a Shakespearean setup, and went on to rub in Mamma Mia!’s advantage over the Bard by adding that “Shakespeare plays aren’t held together by the music of ABBA.” Regardless of whether that puts Mamma Mia! ahead of As You Like It, there’s no doubting that this effervescent show will be exactly as you like it if you’re an ABBA fan, or even if you’re just in the mood to celebrate summer with some musical theater. Call 922-8313 or see pcpa.org.